He’s acted with Vanessa Redgrave in London’s hottest play, The Inheritance. The New York Times says he’s an actor to watch. And Broadway.com gushes that he “burns with a bulb-shattering voltage.” For Andrew Burnap ’13, though, real success is seeing an audience moved by a story well-told. Scene: Much Ado About Nothing. URI’s Robert E. Will Theatre, 2013. Andrew Burnap ’13 as Benedick. Olivia Khoshatefeh ’13 as Beatrice. Offstage, Burnap’s nose is bleeding. Onstage, Olivia shoots him an I-am-so-not-going-to-kiss-your-bloody-face look. It was the pivotal moment in Much Ado About Nothing: Bickering leads Beatrice and Benedick to share their first kiss. But this night, Shakespeare’s comedy was careening toward tragedy. “His whole face was bloody,” Khoshatefeh recalls. She watched as Burnap tried in vain to stop the blood flow, which only made more of a mess. Time was up. 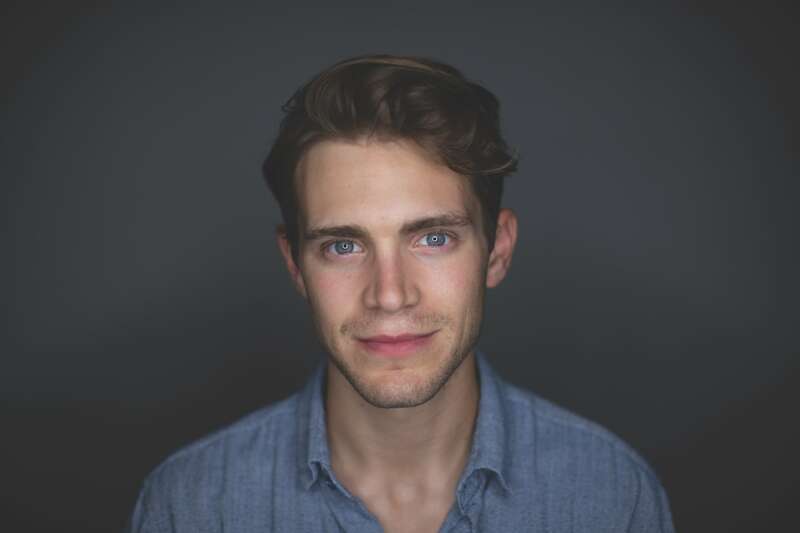 At 27, Andrew Burnap has had more than a few beautiful moments: a stellar undergraduate career at URI, graduating first in his class from Yale School of Drama, making his professional debut as Troilus in Troilus and Cressida in Central Park’s Delacorte Theater. He was one of the youngest actors in Matthew Lopez’s The Inheritance at the Noël Coward Theatre in London after a sold-out, critically acclaimed run at the Young Vic. Allison Burnap will tell you her son started performing early. “After Rocky Horror and Singin’ in the Rain, I knew that he had the talent to do anything,” says Burnap’s father, Tim. URI Theatre Professor Paula McGlasson directed him in both shows. “The ‘It Factor.’ He had it,” McGlasson says. “He exuded sincerity, confidence, great comic timing, and that thing you can’t teach: charisma. He was someone you wanted to watch,” she recalls. URI Theatre Department Chair David Howard was Burnap’s first-year advisor. “It was Rocky Horror that solidified him in people’s minds,” Howard says. “Dr. Frank-N-Furter is the exact opposite of how I perceive Andrew. He completely embraced the whimsy and the depravity of the role. It felt mature and knowing. Scene: Spacious bachelor pad, minutes from the Noël Coward Theatre. London. Sunday, sleeping-in day. Burnap wakes up, has coffee, reads the news. Maybe smiles. Maybe rages. Maybe cries. As a cisgender man playing a gay man in The Inheritance or a transgender transsexual from Transylvania in The Rocky Horror Picture Show, Burnap notes that the characters are signifiers meant to highlight some aspect of a shared human experience. “My job is to show you that I understand the experience,” he says. “I don’t know what it is to be a young, ostracized, gay man grappling with his sexuality, but I do know what it is to be viewed as other, viewed as weird or not normal. “If someone tells you, ‘No,’ ask, ‘Why not?’ Doubt is a useful thing, but it shouldn’t rule you. It should inform and maybe affect some of your decisions, but it should not be the resounding voice in your soul. Then ask, ‘What else can I do?’ Because this quest isn’t easy, and it is filled with people telling you, ‘No.’ But if, in the smithy of your soul, you feel you cannot do anything other than this, then do it—but know it requires that next level of dedication,” he says.